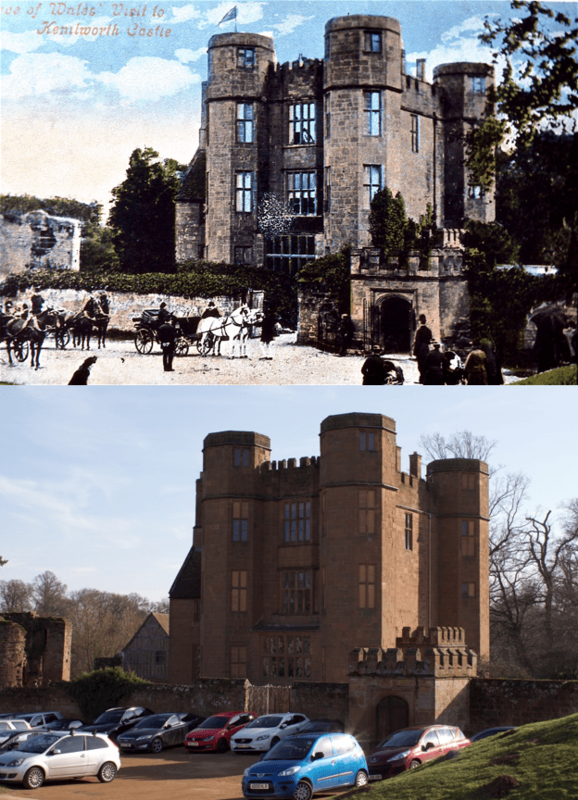 This pair of Then & Now images shows the visit of Edward, Prince of Wales to Kenilworth Castle. The ‘then’ image is an artificially colourised version of another black and white photograph held by Warwick County Records Office. Whoever did the colourisation was evidently unsure which of the Gatehouse windows were bricked up and which were still actually glass! Robin Leach points out that the print is wrongly labelled as 1903. The visit in question was actually the future Edward VII’s earlier visit to Kenilworth in 1892 when still Prince of Wales. Edward VII had already been crowned King in 1902, ceasing to hold the role of Prince of Wales in the process, following the death of his mother Queen Victoria in 1901. Robin covers these events in some detail in Kenilworth People & Places Volume 2 (Rookfield Publications, 2013). The party of horses and carriages is patiently awaited by a single policeman, a small gathering of ladies with prams and a boy leaning rather casually against the stone gate arch. Apart from the cars, little else appears to have changed between the two scenes in over a century. Thanks to Robin Leach for the additional date clarifications in this article.